Add the pecans, cacao nibs, chia seeds, baking soda and salt to a food processor and pulse for 10-15 seconds or until everything is coarsely chopped. Add the maple and pulse until the dough starts to form in to a ball.Scoop out a tablespoon of dough and roll in to a ball and place on the baking sheet. Use your thumb to make an imprint in the middle of the cookie. Repeat with the remaining dough.Cook for 8-10 minutes or until slightly browned around the edges and remove from the oven. 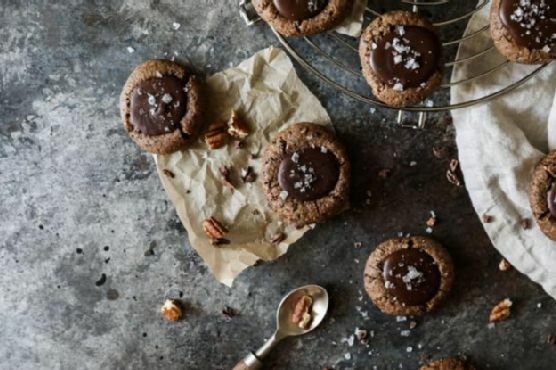 You may need to use your thumb or the back of a spoon to make an imprint again after it rises in the oven.Melt the chocolate and mix it with the tahini.Scoop 1-2 teaspoons of the chocolate filling in to each cookie. Place in the refrigerator until chocolate has set completely. Top with sea salt flakes if desired.